The government plans to implement non-cash payment transactions on all toll road segments in Indonesia starting in 31 October 2017. Starting from September 12th, several toll gates in Jabodetabek area within Jalan Tol Dalam Kota Ruas Cawang-Tomang-Pluit and Prof. Ir. Dr. Soedijatmo have implemented non-cash payment system. In order to facilitate the public to obtain electronic money, electronic card will be on sales in toll booths, as well as the addition of top up locations of electronic money centers. The initiative is following government’s commitment to further encourage people to switch from using cash to e-money. It is also expected to speed up the payment process on the highway, so people can travel more comfortably. To prepare for this, Bank Indonesia (BI) as payment system authority continues to coordinate with the government, particularly the Ministry of Public Works and Housing (Kemen PUPR) as the toll road authority and the Ministry of Transportation as the transportation authority, in order to prepare the implementation of electrification of toll road payments. Electronic payment systems on toll roads will also apply interconnection and interoperability through the secure access module (SAM) multi applet, which is the application of infrastructure that supports the implementation of multi bank issuers to provide interconnect electronic money services. The types of electronic money (e-money) that can be used include e-toll card Mandiri, e-money Mandiri (which also can be used for TransJakarta and Commuter Line), BRIZZI, BNI Tap Cash, Blink BTN and BCA Flazz. 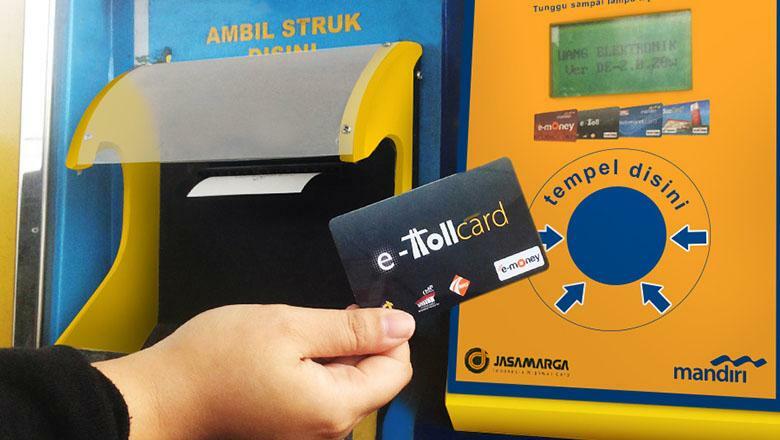 Customers can buy and top-up e-toll card in all Bank Mandiri, BNI, BRI, BCA, and BTN branches in Jabodetabek, Indomaret or Alfamart (convenience store), and toll road gates in Jabodetabek. Some other areas will also have a head start, depending on their readiness such as Bali which will be effective on October 1.